This week we're pleased to present the picks of Robert Hough, author of the upcoming The Man Who Saved Henry Morgan; Nina Berkhout, author of The Gallery of Lost Species; Harry Karlinski, author of The Evolution of Inanimate Objects; Ann Dowsett Johnson, author of Drink: The Intimate Relationship Between Women and Alcohol; and Steve Stanton, author and former president of Canada's national association of science fiction and fantasy authors. The year was 2003. The title was Black Bird and it was the first title by a Montreal native named Michel Basilières. As I say, I’m not sure whether I went out and bought it, or whether Anne gave me a copy. I do, however, keenly recall the impression I had when I first read it. This, I thought, is not like other books. 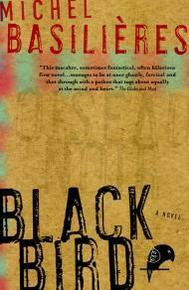 Black Bird tells the story of a family of grave robbers who live in Montreal in the '70s. One of the family members is an FLQ terrorist, another is a ghost, and another is run over by a drunk driver who bears a distinct resemblance to Rene Levesque. The family lives in squalor, stealing electricity from the house next door, and the family pet is a large black crow who plucks the patriarch’s eye out, plunging him into a depression that badly cuts into the family’s corpse-stealing business. Each character is more original than the next, the humour is as sharp as a sashimi knife, and the plot is constructed in such a way that the beginning is also somehow the end. Yet what I liked most about Black Bird was its satire. When a comic novel’s target is too obvious, I tend to reject it: I like to be beguiled, and not beaten over the head. With Black Bird, it was obvious that Basilières was making some commentary about life in Montreal during the October crisis. Yet what that comment was floated just beyond my reach, looking hazy and indistinct. For this reason, I couldn’t stop reading, fearing that if it did ever come into focus I might not be there to see it." Robert Hough’s novels have been nominated for numerous awards, including the , the International IMPAC Dublin Literary Award, the Trillium Book Award, the Rogers Writers’ Trust Fiction Prize, the Scotiabank Giller Prize and the Governor General’s Literary Award. His latest novel, The Man Who Saved Henry Morgan, will be published by House of Anansi Press in April. He lives in Toronto. "If you thought your family was dysfunctional, wait until you meet the Saints. I couldn’t put Sarah Mian’s brilliant debut novel down, and read it in one sitting. This is the story of Tabatha Saint, who heads back to rural Nova Scotia to find her parents and siblings ten years after being sent away to a foster home. When she arrives in Solace River, she learns that her notorious family has been kicked out of town. Tabby is then left to track everyone down and reunite what’s left of her disgraced clan. Tabby is a spunky and fearless survivor who refuses to be doomed by her circumstances. Only her tough love can save her family, if she decides they’re worth saving. 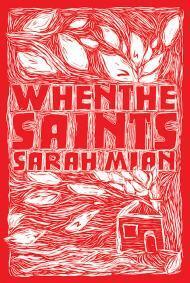 Issues of poverty, violence, abuse, and addiction are addressed, yet When the Saints is anything but a depressing read. Gritty humour shines through each page. There are so many cringe-worthy, laugh-out-loud, and touching moments in this bittersweet story. With vivid, razor-sharp prose, Mian has created an unforgettable landscape and an endearing cast of characters who are still stuck in my mind weeks later. I can’t wait for her next book." Nina Berkout is the author of five poetry collections, most recently Elseworlds, which won the 2013 Archibald Lampman Award. Originally from Calgary, Alberta, she now resides in Ottawa, Ontario, where she works at the National Gallery of Canada. The Gallery of Lost Species is her first novel. "Do you want to know what a writer’s life is like? A frequently impoverished, honest-to-goodness real writer’s life? 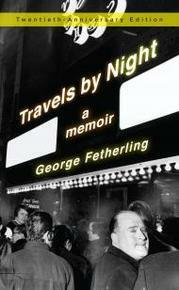 Then read Travels by Night by the iconic Canadian writer George Fetherling, first published in 1994 and reissued in 2014 as a Twentieth Anniversary edition by Quattro. Travels is many things: a thoughtful coming-of-age memoir; an insider’s clear-eyed account of Toronto’s literary birth in the late 1960s; a series of succinct and witty annotations of now well-known Canadian authors and their writing. Most of all, however, Travels is a quietly inspiring and honest account of a young writer determinedly, ethically, earnestly learning his craft. The book ends as Fetherling turns 21. Forty-five years and just as many published works later, George Fetherling is still going strong, still leading the writer’s life. Now you’ll know why." Harry Karlinsky is a clinical professor of psychiatry at the University of British Columbia. He is the director of the award-winning Frames of Mind Mental Health Film Series. His first novel, The Evolution of Inanimate Objects, was longlisted for the Wellcome Trust Book Prize. "All my life, I have been entwined in a strong embrace with my sister, only 17 months my junior. She, who is my polar opposite, is a mirror for me. This is a defining relationship, and only one of the reasons I adored Miriam Toews’ All My Puny Sorrows. Thanks to the mesmerizing voice of the narrator, the book is an emotionally powerful portrait of sisterhood. The narrator is the all-too human, self-deprecating Yoli, dealing with the fact that her sister Elfrieda, a renowned concert pianist who has charmed the world, wants to die. 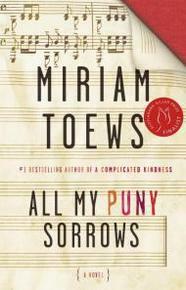 Toews tackles the toughest of subjects—depression, suicide and death—and never slips into sentimentality. Beautifully paced and astute, All My Puny Sorrows explores the ups and downs of sisterhood: the irritations, the intimacies, the tidal tug of this connection. 'Elf’s smile is an event,' says Yoli, matter-of-factly. 'Swivelhead, attempt to be cool,' says Elf, as her sister heads out in the world. The cool sister wants to die; the uncool sister is refreshingly alive, imperfect and relentlessly devoted to the messiness of real life. As Yoli perseveres and Elf recedes, the book gathers pace and force, ending in a transcendent burst of compassion. Toews’ eye—always tender and knowing and humorous—is at its best in this book. All My Puny Sorrows is a triumph, a window into one of life’s most profound relationships." Ann Dowsett Johnson is the author of Drink: The Intimate Relationship Between Women and Alcohol. The winner of five National Magazine Awards, she s a writer and editor recognized for her expertise in higher education and alcohol policy. A recipient of the Atkinson Fellowship in Public Policy and a Southam Fellowship in Journalism, she spent most of her professional career at Maclean's magazine, where she was best known as the chief architect of the university-rankings issue. "The widely acclaimed Tesseracts anthology series has run for thirty years in Canada, since first launched by Judith Merril in Toronto in 1985, but Tesseracts Nine stands out as the first anthology published after Hades Publishing purchased Tesseracts Books in 2003 to publish under the EDGE imprint from Calgary. Two international award-winning editors assembled this collection of “New Canadian Speculative Fiction” in 2005, Geoff Ryman and Nalo Hopkinson, and their chosen cover design was a beacon for gender fluidity at the time. The content in Tesseracts Nine is difficult to categorize, straining the bounds of possibility from far-out fantasy to hard science fiction. Two of the stories feature talking animals, for example, and another uses talking crows as metaphors for thought and memory. Although the authors are all Canadian, the topics are international in scope, including a sacred festival in Mexico, burial rites in ancient Egypt, street orphans in Haiti and vampires in downtown Toronto. Other highlights include the poignant aftermath of a crash landing on a distant planet, a curlicue story of interdimensional transport across space and time, an exobiological analysis of an alien in amber, and Timothy J. Anderson’s delightful rendition of an end-of-life experience. Death is a pervasive theme in this collection and many stories are serious in tone, but there is more hope than horror in this anthology, and a keen sense of the wonder and mystery of existence."